Earlier this month, a Georgia judge set the stage for a confrontation between President Obama and attorneys representing the birther movement. In the case, David Weldon, a Georgia citizen, had filed a complaint questioning the legality of Obama’s placement on the ballot due to their belief that he is allegedly not a “natural born citizen.” A Georgia judge refused a request by Obama’s lawyers to dismiss the case and set January 26 as the date for a hearing. As illustrated by the comments on a recent Examiner.com article, many birthers believe that this case will result in the dismissal of President Obama and the rescission of all the legislation and executive orders of the past three years. They should disabuse themselves of such foolish notions. Article II of the Constitution makes only three requirements for eligibility of a president. First, a president must be a “natural born citizen.” Second, he must be 35 years old. Lastly, he must have been a resident of the U.S. for 14 years. The Constitution does not define what a “natural born citizen” is, but the evidence is that Barack Obama is one. Although he had released a short form birth certificate in 2008, in 2011 Obama released his long form birth certificate that shows that he was born in Honolulu, Hawaii on August 4, 1961. Hawaii became America’s 50th state on August 21, 1959. Therefore, Barack Obama is a “natural born citizen” by virtue of the fact that he was born in the United States and “and subject to the jurisdiction thereof” (14th amendment). There is other circumstantial evidence to support the information on the birth certificate as well. 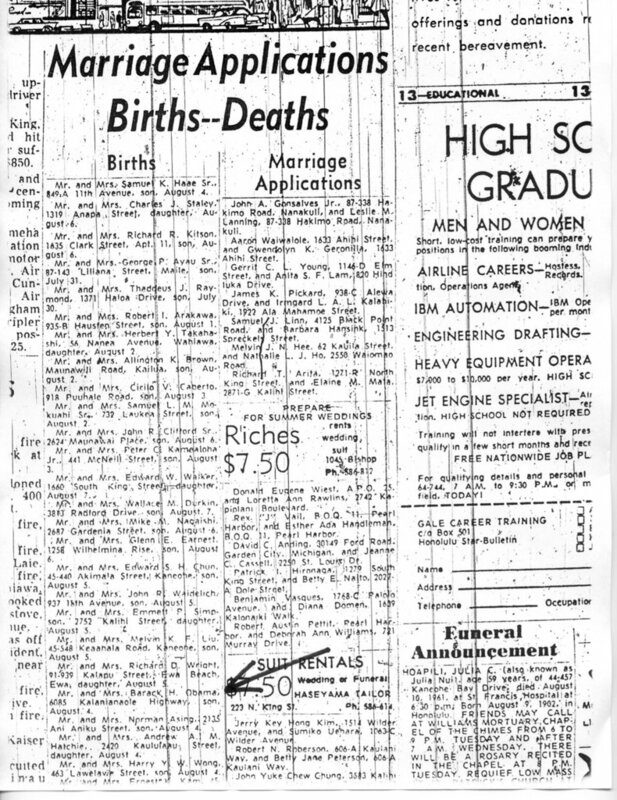 Obama’s birth announcement was in not one but two Honolulu newspapers in 1961, the Sunday Advertiser and the Star Bulletin. A Honolulu obstetrician actually remembers discussing the birth of Obama according to Snopes. The combination of a Stanley giving birth (Obama’s mother’s name), the first black student at the University of Hawaii, and the “musical name” of Barack Hussein Obama apparently made the birth memorable. On the other hand, the evidence against the birthers is mounting. Several purported Kenyan birth certificates have been proven forgeries. Likewise, claims that Occidental College records showed that Obama, a.k.a. Barry Soetoro, was awarded a scholarship for foreign students was revealed to be an email hoax. Occidental has not released his records at all. A claim that Obama’s grandmother said that he was born in Kenya is taken wildly out of context. The full transcript makes it clear that she said that Barack Obama was born in the U.S.
Obama is also a natural born citizen because his mother was a U.S. citizen. In the Wong Kim Ark case (1898) the Supreme Court ruled that the only native-born children excluded from citizenship were those born to foreign diplomats, born on foreign public ships, born to enemy forces engaged in hostile occupation of enemy territory, or to Indian tribes which were excluded from U.S. jurisdiction. Birthers argue that, because Obama’s father was a Kenyan citizen and British subject, Barack Obama is a British citizen under the British Nationality Act of 1948. According to FactCheck.org, Obama did indeed hold dual citizenship as a child. After Kenyan independence, however, the Kenyan Constitution prohibited dual citizenship. Dual citizens lose their Kenyan citizenship at age 23 unless they renounce their non-Kenyan citizenship and take an oath of allegiance to Kenya. Obama never did so. Dual citizenship does not affect Obama’s status as a natural born U.S. citizen. In Afroyin v. Rusk (1967) the Supreme Court ruled that “"Congress has no power under the Constitution to divest a person of his United States citizenship absent his voluntary renunciation thereof." Again, in Vance v. Terraza (1980), the Court ruled that citizenship must be surrendered voluntarily. Barack Obama has never renounced his U.S. citizenship. Even if Barack Obama were not a natural born citizen, there is no legal remedy for his removal from office at this point. If such a fact were determined prior to the 2008 election, or ideally before his election to the Illinois legislature and the U.S. Senate, he could have been kept off the ballot, but the Constitution makes no provision for removing a president from office because he is ineligible. According to the Constitution, there are only two ways to remove a president from office. The first and most obvious way is to have him lose his re-election attempt. The second method is impeachment, which is addressed in Article II Section 4. Grounds for impeachment and removal from office include “Conviction of, Treason, Bribery, or other high Crimes and Misdemeanors.” Being ineligible to hold office is, perhaps ironically, not grounds for impeachment. This is especially true in light of the fact that Obama has no personal knowledge of his birthplace. No one can remember the time and place of their birth. Even to allege fraud on the part of the president, which is arguably not a “high crime and misdemeanor,” prosecutors would have to prove that Obama had the intent to deceive, not with regard to his radical agenda, but with regard to his birth certificate. Obama can plausibly make the claim that he thought that he was born in Hawaii because his parents told him so and gave him a Hawaiian birth certificate. Further, in the impeachment process the House of Representatives makes the original finding of guilt, but the Senate has to vote to remove the official from office. Given that the Democrats control the Senate, can anyone seriously believe that they would vote to remove a president of their own party on such as flimsy basis? By the time the Republicans gain control of the Senate, Barack Obama will hopefully be out of office as well. The Constitution does not give the judiciary the power to remove any elected official from public office. It would therefore be unconstitutional for a judge to exceed his authority and remove President Obama from office. This is a good thing. It would set a terrible precedent for an unelected judge to overrule the will of the people and their electoral college. Even if President Obama were impeached and removed from office, it would not erase the damage of the past three years. People who believe that all of the Obama-era legislation and executive orders would magically disappear are deluding themselves. Article I Section 7 of the Constitution stipulates that “if any Bill shall not be returned [vetoed] by the President within ten Days (Sundays excepted) after it shall have been presented to him, the Same shall be a Law” unless Congress adjourns before the ten days is up. The president does not have to sign a bill for it to become law. Even if President Obama is not eligible, the members of Congress who voted for legislation such as the Affordable Care Act (Obamacare) and the Dodd-Frank financial reform were eligible to hold office and voted to pass legislation that was legally binding. These bills would have become law even without Obama’s signature. When the hearing is held in an Atlanta courthouse on January 26, the judge’s hands will be tied. The only question that he is legally entitled to decide is whether Barack Obama is eligible to appear on the ballot for Georgia’s 2012 presidential election. When Obama’s lawyers present the president’s Hawaiian birth certificate, the judge will rule in their favor.